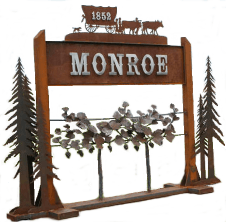 Monroe Oregon is located in South-East Benton County and nestled in the foothills of the Coast Range. Strategically positioned in the mid-Willamette Valley, the City of Monroe is between Corvallis and Oregon State University to the north and Eugene with the University of Oregon to the south. This unique location offers very diverse opportunities including hiking and mountain biking, fishing on the Alsea River, Division I sports at both Oregon State University and the University of Oregon, or wine tasting at local wineries. Monroe’s beautiful natural surroundings offers an attractive site for business and tourist development. On January 27th, 2019, The City of Monroe has been awarded a Continuing Authorities Program (CAP) 1135 project to investigate ecosystem restoration on the Long Tom River at Monroe. Under the authority provided by Section 1135 of the Water Resources Development Act of 1986, the Corps may plan, design and build modifications to existing Corps projects, or areas degraded by Corps projects, to restore aquatic habitats for fish and wildlife. Projects conducted in the Southern Willamette Valley have included wetland restoration, wildlife habitat restoration, anadromous fish passage, and river restoration, sometimes with associated compatible recreation features such as walking paths and access areas. Projects must be in the public interest and cost effective for the ecosystem benefit gained and are limited to $10 million in Federal cost.